Purchase a Try Me Package to experience PBM therapy for yourself! PBM therapy at our Financial District wellness spa offers a wealth of benefits for the mind, body, and soul. We know you will love the results, which is why we offer our customers a special “Try Me” rate of just $99 for three PBM sessions. 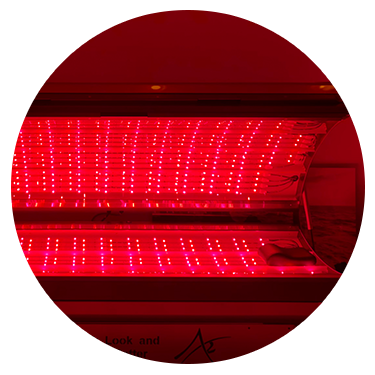 PBM therapy utilizes red, green, and near-infrared light to promote healing at the cellular level, reducing the oxidative stress on our cells and speeding up recovery time. Keep reading below to learn more about this amazing light therapy! Are You Ready To Commit To PBM Therapy? The ARRC (Advanced Rejuvenation and Recovery Chamber) ATP provides Photobiomodulation (PBM) Therapy which is the application of Red, Green and Near-Infrared light and has been clinically proven to reduce inflammation, support immune function, and stimulate cellular repair, resulting in improved muscle performance, improved joint motion, enhanced wound healing and much more. It is safe, relaxing, and has no known negative side effects. In recent studies, Photobiomodulation has demonstrated increased exercise capacity and longer exercise times, as well as improved biomarkers (including reduced lactate, creatine kinase, and CRP) after exercise in people treated with red and infrared light. Photobiomodulation has also been reported to release certain brain compounds that positively affect mood and sleep. Why do we need whole body Photobiomodulation? Our cells age due to stress and poor nutrition (and diets). This means we age from the inside out. Cellular aging is called oxidative stress and caused by free radicals (cells that are really just burglars stealing energy from other cells). All conditions we suffer from start from this condition. But, certain colors of light at specific intensities are absorbed by the body at the cellular level. When this happens, magic occurs and our bodies are brought back to good health. The ARRC ATP delivers optimal colors of light and power to slow down the effects of time and speed up recovery. When we are able to complete the absorption of oxygen into our ATP (batteries of our cells) and fire up the Mitochondria (factories of our cells) you can solve a multitude of chronic conditions, increase your energy and ultimately take your health to a whole new level in just 10 minutes/day, 2x week. The use of visible and near-infrared (NIR) light for reducing pain, inflammation and edema, has been known for almost forty years. The effects are photochemical – just like photosynthesis in plants. First we must understand a bit about the cell itself. The air we breathe and the food we eat is combined in the cell to create cellular energy called Adenosine Triphosphate (ATP). The actual process occurs in the electron transport chain which is located in the mitochondria, the power plant of the cell. Located at the final step of this chain is an enzyme called Cytochrome C Oxidase (Cox). It is where oxygen attaches and ATP is produced with water as a byproduct. When cells undergo stress, such as cigarette smoking, too much sugar in our diet, too much sun on our skin, an injury etc, there will be an increased amount of free radical production. Specifically a molecule called Mitochondrial Nitric Oxide (mNO). This molecule has a higher affinity for that enzyme Cox than oxygen does, so it attaches there first. There is then fewer or no place for oxygen to attach, so the cell is unable to produce as much ATP as it needs to function well and it becomes even more stressed, beginning to produce a very volatile free radical called Reactive Oxygen Species (ROS). Typically the cell manages and neutralizes free radicals with rest and antioxidants, however the inability to do this fully results in Oxidative Stress. If you have ever seen a metal object rust, you have seen oxidation. If left unchecked it can actually create holes in the metal. In our cells, oxidative stress is accepted as the underlying trigger for most diseases and degenerative conditions. It is also a component in the inflammatory phase of acute and chronic injuries, as well as the aging process. What can PBMT do for you? The ARRC ATP is the first and only Photo- biomodulation device to deliver all of the necessary light (Red, Near Infrared and Green) in the optimal parameters to the whole body in only 10 minutes. The intended uses of the ARRC ATP are restoration of motion to joints, improved muscle performance, decreased post exercise soreness, and adjunct to obesity as part of a diet and exercise program. It does have a multitude of other benefits as seen in actual clinical trials. How does PBMT compare with other treatments? PBMT works at the cellular level, stimulating repair and normalizing cell function. Many therapies only address symptoms, without addressing the source. With that said, chronic degenerative changes often cannot be “healed”, instead they must be managed. PBMT is a safe, effective, non pharmaceutical way to manage pain and inflammation. That depends on you and your “Human Variables”. Every person’s condition is unique, therefore there treatment course is as well. However there are some general rules of thumb that apply to PBMT. Acute injuries and inflammation from muscle strains and sprains, cuts, bruises, burns, etc typically show very rapid improvement and can resolve in 2-3 treatments. Long-term, chronic conditions can take as many as 12 sessions to get significant benefits. How often will I need to have PBM? Therapy can be done daily, however that is not always practical or convenient. Minimum interval recommendation is 2-3 times per week until your goals are met, then 1-2 times per week for ongoing maintenance. For individuals who exercise frequently or at high levels, 3-5 timed per week is recommended for optimal recovery. What is the session process like? You can disrobe to your level of comfort. It best done with least amount of clothing, either a bikini or briefs. Unlike high intensity lasers, PBM Therapy does not heat tissue. It does, however, increase circulation so a warming sensation is often experienced. Occasionally, some clients may experience mild fatigue, discomfort, or aches after a session. These responses should reduce after 24-48 hours; if they persist notify us. Don’t rely on opinion, look at the science! There are over 3,000 studies on LED Light Therapy(PBMT), now called Photobiomodulation. We recommend the NIH website for controlled, peer reviewed and published studies to get what may be the best pure science. Manufacturer based studies are frequently skewed to the biases of the manufacturer and the products they sell. Below are studies found on the NIH website linked to specific conditions. When you click the links below you will be taken to supporting research for that condition on the National Institute of Health website. The righthand sidebar on the NIH website shares similar studies for that condition. To go deeper into research on a specific condition you can either click onto similar studies or perform a search on the NIH site search bar at the top of the page. These are medical studies with terminology that can be difficult for most. If you are not familiar with medical terms, you might choose to read the Conclusion at the bottom of each page first. There have been a large number of both animal model and clinical studies that demonstrated highly beneficial PBMT effects on a variety of diseases, injuries, and has been widely used in both chronic and acute conditions (see Figure 7). PBMT may enhance neovascularisation, promote angiogenesis and increase collagen synthesis to promote healing of acute (Hopkins et al. 2004) and chronic wounds (Yu et al. 1997). PBMT provided acceleration of cutaneous wound healing in rats with a biphasic dose response favoring lower doses (Corazza et al. 2007). PBMT can also stimulate healing of deeper structures such as nerves (Gigo-Benato et al.2004), tendons (Fillipin et al. 2005), cartilage (Morrone et al. 2000), bones (Weberet al. 2006) and even internal organs (Shao et al. 2005). PBMT can reduce pain (Bjordal et al. 2006a), inflammation (Bjordal et al. 2006b) and swelling (Carati et al. 2003) caused by injuries, degenerative diseases or autoimmune diseases. Oron reported beneficial effect of PBMT on repair processes after injury or ischemia in skeletal and heart muscles in multiple animal models in vivo (Ad and Oron 2001; Oron et al. 2001a; Oron et al. 2001b; Yaakobi et al. 2001). PBMT has been used to mitigate damage after strokes (in both animals (Lapchak et al. 2008) and humans (Lampl et al. 2007)), after traumatic brain injury (Oron et al. 2007) and after spinal cord injury (Wu et al. 2009). Beneficial Tissue effects of PBMT can include almost all the tissues and Organs of the body.